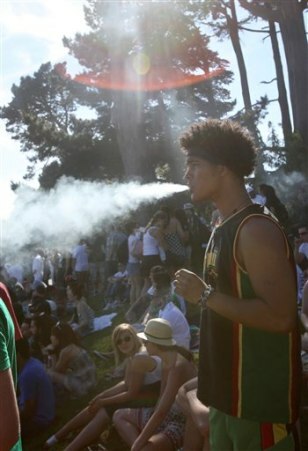 On April 20, 2009 marijuana smokers gather on Hippie Hill in Golden Gate Park in San Francisco. Afternoon smoke breaks took on added meaning as marijuana advocates observed what has become their unofficial national holiday each April 20. Marijuana consumes a vast amount of time and money on the part of law enforcement, accounting for more than 40 percent of drug arrests nationally even though relatively few pot-only offenders go to prison.